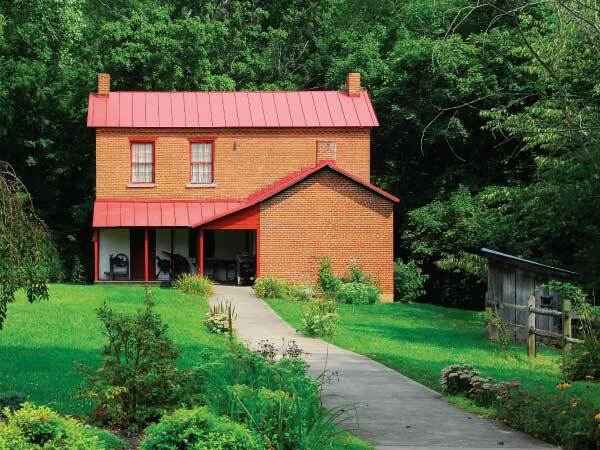 Just south of the fort stands an original farmhouse built in 1859 by Job Prickett, the great-grandson of Captain Jacob Prickett. The Job Prickett House has been restored to provide visitors a glimpse of the progress that took place in the Pricketts Fort community between the 18th and 19th centuries. Although still primitive by today’s standards, the brick home illustrates the evolution of an increasingly civilized lifestyle, and the availability of mass-produced furnishings. The simple floor plan of the home is typical of a 19th century farmhouse; however, Job Prickett incorporated several unique architectural styles into the exterior. The front of the home reflects the Federal style, with two doors and four windows. The Greek Revival style was used in the appearance of the flush chimneys and the four-panel, transom-topped doors. Many of the family’s original furnishings, tools, and handmade objects have been carefully preserved and are on display in the house. The Job Prickett House was put on the National Register of Historic Places in 1974.